John Frieda, exclusive to Clicks, has just launched yet another range that specifically targets blondes. (FYI, their Go Blonder range, the one that lightens up your locks is lovely, as is their tone-correcting violet shampoo, but I’m not sure if the latter’s still available at Clicks as I haven’t seen it for a while.) 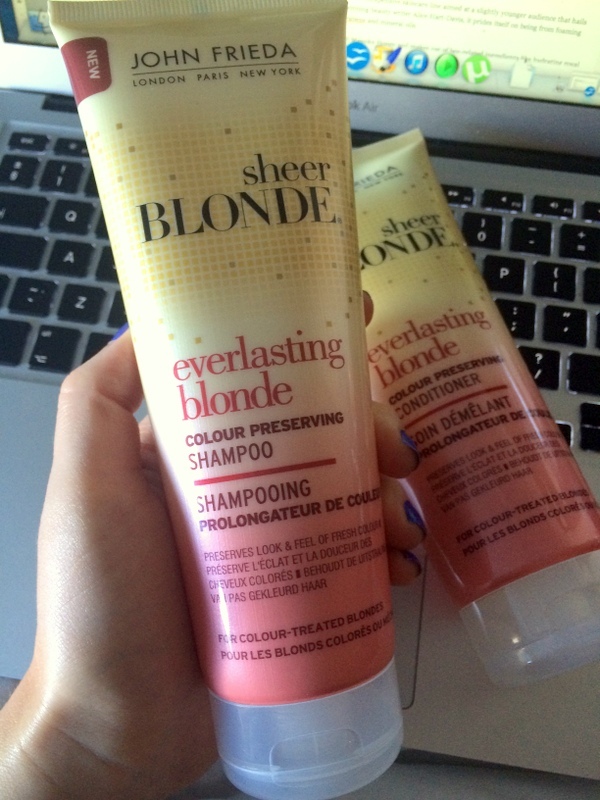 Anyway, let’s talk about the newbies – Everlasting Blonde Colour Preserving sham and con (R95 a pop). If you’re a blonde poppie soos ek, you’ll know you can step out the salon with light, bright locks, but these eventually ‘dull down’ as time goes on. John Frieda’s new line reckons it can help prevent this by removing the mineral deposits (found in water) that make your hair look ‘meh’ and makes use of ‘water-resistant technology’ to minimise the amount of water that penetrates into your hair shaft. I have no clue what kind of tech that is. A coating of silicone? Either way, I really like these guys. They’ve got a lovely fresh-floral scent and leave my hair feeling clean but easy to brush when wet and bouncy and light when dry. I can’t comment on the colour-preserving aspect just yet as it’s been about six weeks since I last got highlights, so any oxidation and what not’s already taken place. But I’m now going to pop Everlasting Blonde into my bathroom cabinet and bring ’em out again after my next salon session to see if I notice any difference in how long I can keep my colour-looking ‘bright’, after which I’ll update this post. Between you and me, I don’t think South Africa has many true BB creams. The whole idea is that they’re supposed to treat while covering and, while many of the BB’s do have active ingredients in them, for the most part, the concentration is minimal which, in my eyes, makes them tinted moisturisers or light foundations. Justine’s new BB (price TBA) is one of those products – it’s really more of a light, hydrating mineral-based foundation than a BB. But in saying that, it’s a fabulous one. The medium shade is actually quite dark but as it’s nice and sheer and blends like a dream, I can get away with wearing it and it gives my skin a healthy-looking glow. 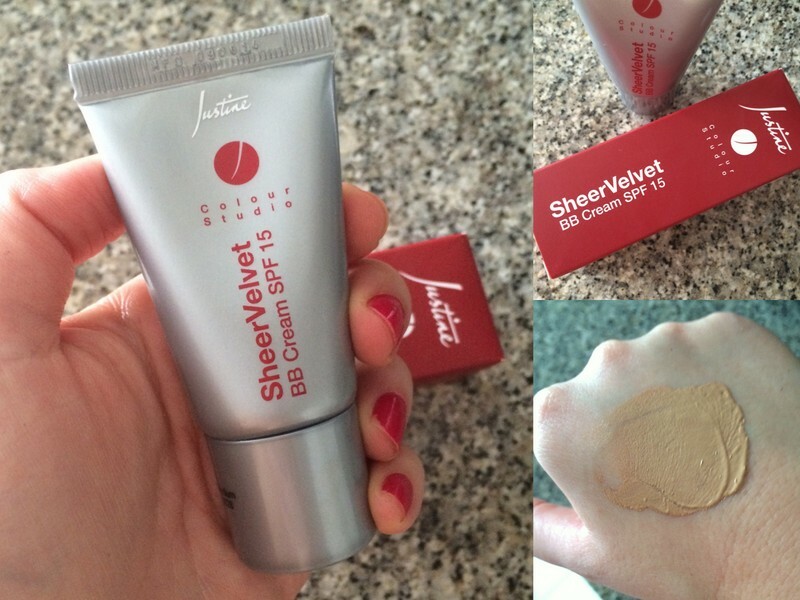 Also, as the formula contains lots of Alumina, a light-reflecting pigment, the radiance-factor’s boosted even further. Another plus? It doesn’t feel heavy or greasy on my oily-combo skin, something other more ‘hydrating’ BBs and tinted moisturisers have done in the past. But to wrap this up, in short, this is luuurvly stuff. The line’s latest collection is called Manuka Honey and makes use of bee-related ingredients like hydrating royal jelly, beeswax, honey and propolis (a mix of beeswax and resin) as well as the teensiest drop of ‘venom’ that, the brand reckon, can help boost collagen production. Of all the items in the line – a Daily Moisturiser, Cream Cleanser, Refining scrub and Radiance face mask – I reckon the cream cleanser would be the winner in regards to making promises and delivering. As far as natural ‘actives’ go, it makes use of hydrating glycerin, beeswax, honey (also a good antibacterial ingredient) and royal jelly as well as antioxidants vitamin E, honeydew melon and black raspberry juice. It’s also got a subtle floral-honey scent that reminds me a bit of The Body Shop’s Honeymania line and did a nice job of dissolving make-up before I wiped it off with a hot cloth. Afterwards, my skin felt cleansed but without being stripped of moisture. The Radiance face mask, essentially a kaolin (white clay) mask to absorb ‘impurities’ and excess oil from your gesig is also rather nice. It also makes use of beeswax, honey, melon and black raspberry as well as the teensiest dash of papaya to ‘brighten’, although I wouldn’t rely on it as my sole source of exfoliant. If you really want to peel and reveal using papaya specifically, I’d rather invest in something like Elemis Papaya Enzyme Peel. Or you could just go hard guns like I do with the AHA’s in Optiphi’s awesome Classic Refine-Foliant kit or Environ’s Intensive Alpha Hydroxy Gel. 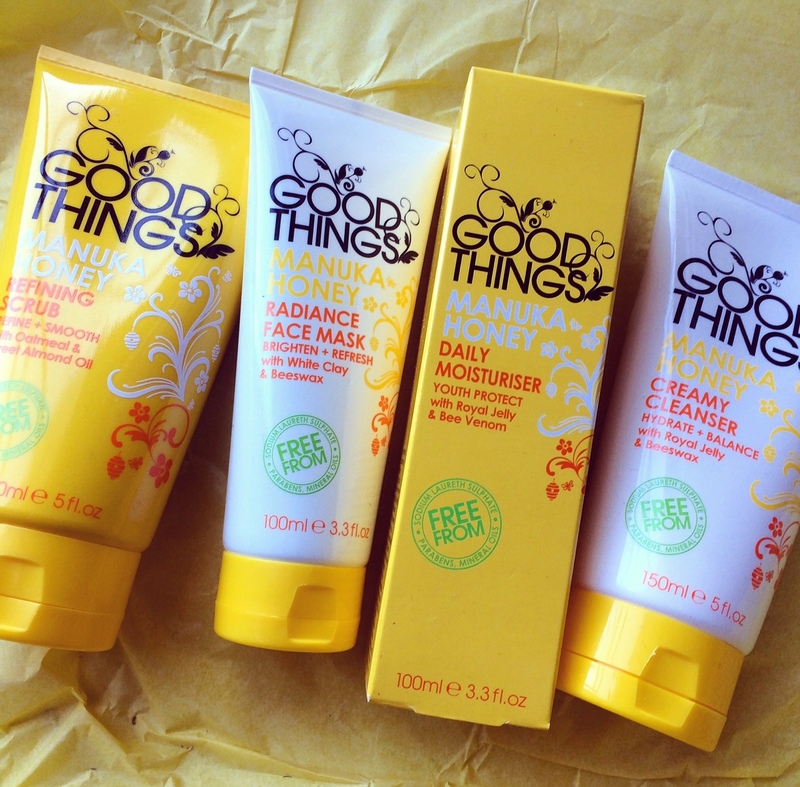 But ja, if you’re looking for a lekker kaolin mask that won’t break the bank – and is also cost-effective in that it’s not being sold to you in a single use sachet – Good Thing’s Manuka Honey variant is a very nice option. Also, here the pretty scent is super duper evident.